Sabbath Walk: Thanksgiving for everything? Are you kidding me? TITLE: Thanksgiving for everything? Are you kidding me? How is it possible to give thanks in everything? Tom went into a business partnership with his best buddy Tim. Both put in their fair amount of hard work. One day, for some reason, Tim decided to take the money that was meant to be deposited into the business account and absconded. How on earth is it possible for Tom to be thankful about what had happened? Patricia prayed for years for the eventual healing of her sick mother. She had faith. Faithfully she asked her church elders to lay hands, to pray, and to anoint her mother's head with oil. She followed the best medical advice given to her, took her mum regularly for treatment. Unfortunately, her mum died a year later. How can Patricia give thanks? After working faithfully for his employer for 30 years, Anthony was laid off and were treated the same way as a 1-year old employee. How can Anthony be thankful about such a treatment to him, a loyal and faithful worker? Life is tough. Many things can be planned, but outcomes are very much unplanned. A business failure, a death, and a terminated career are some of the things that make thanksgiving such a difficult thing to do. It is easy to simply take things for granted. Whether it is a cleaner at the food courts, or the parking attendant, we tend to assume that it is their job to do what they are supposed to do. When we see dirty spots on our table and off we go, barking at the frantic cleaner to come and clean up. Sometimes, just waiting a few minutes longer for the response drastically reduces our readiness to thank the cleaner. Consider the parking attendant. He is doing his job, applying company policies to vehicles that have breached the time limit for parking. Drivers who have received violation tickets are normally mad. Are we to withhold thanks from people who are merely doing their jobs, and who have inadvertently annoyed us with violation tickets? After all, aren't errant drivers at fault in the first place? Perhaps, the reason why Paul exhorts the Thessalonians to give thanks in everything comes out of something less externally affected, but internally motivated. Things done to us may irritate us and make us unhappy. External things are not within our control. The same is not true for internal. Like Jesus' teaching about turning the other cheek when a person slaps him. Or the fact that if we have two coats, to keep one, and to give the other away. Or the example of giving in secret instead of in public. All of these actions stem from the inner self. It transforms an internal heart of gratitude into external actions of thanksgiving. Good fruits come out of a good tree. An inner disposition drives an outer application. Jesus has even said about a kind of unclean condition. He reminded the people. When our hearts are far from God, we cannot honour God with our hearts. Likewise, if our hearts are not thankful in the first place, thanksgiving is more a challenge than a joy. In the story of the ten lepers, Jesus laments at the poor level of thankfulness in the hearts of people. Out of ten people who desired to be healed, and who were healed, only one returned to Jesus and thanked Him. Not only that, he was a Samaritan, a 'foreigner' as recorded in Luke 17:18. The story has several pointers with regards to thanksgiving. 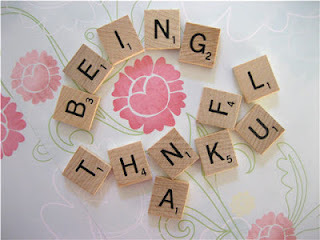 It is sad that people in general have lots of opportunity to demonstrate thankfulness. The sad case is that many chooses NOT to. Christians are called to be thankful for everything because without God, we are nothing in the first place. When we are thankful, we acknowledge that God is in control and we are trusting God to deliver the best, not on our own mortal timeframe, but in God's eternal timelessness. The ten lepers were all healed, but the poor rate of thanksgiving only goes to show that man's default condition is sin manifested in unthankfulness. Jerry Bridges in his book, "Respectable Sins" have even called unthankfulness a sin. An interesting thing in the story of the ten lepers occur in Luke 17:19. "Then he said to him, 'Rise and go; your faith has made you well.'" Note the four acts of the tenth leper. He intentionally came back. He praised God loudly. He flung himself at the feet of Jesus. He gave thanks. Only a person deeply touched can do such things. It goes beyond the head and flows from the heart. Such a thankful heart is what Paul is asking the Thessalonians to practice. Finally, let me close with some of the possible reasons why the other nine lepers did not return to give thanks. SKEPTICISM: "How do I know if the healing is permanent or not?" PRESUMPTUOUS: "I'm sure others can do it." UNTHANKFULNESS: "Am I supposed to give thanks in the first place?" INFERIOR COMPLEX: "Jesus is so high, and I am so low. How can I even approach Him?" SUPERIOR COMPLEX: "Jesus is a Jew. I am a Samaritan. How can I thank Him?" TAKE FOR GRANTED: "Jesus is supposed to do his job anyway." FEELING UNJUST: "I have suffered so long. Why didn't Jesus heal me earlier?" VICTIMIZED: "If Jesus is God, He should have prevented me from being leprous in the first place!" Is it possible that the nine men who failed to return are guilty of at least one of them above? Perhaps. May we be free from these acts of ungratefulness as we reflect upon the immense grace of God as we think of Christ willingness in going to the cross.